I’d wager there is plenty of March Madness going on today in New Orleans because it is Fat Tuesday. Mardi Gras is French for “Fat Tuesday”—the final feasting before the fasting of Lent, which begins tomorrow, Ash Wednesday. Fat Tuesday is also called Shrove Tuesday, a name that comes from the practice of shriving—purifying oneself through confession—prior to Lent. In many countries, Mardi Gras is the culmination of the carnival season of revelry and feasting. I have visited the beautiful city of New Orleans on numerous occasions, but have stayed clear during Mardi Gras. I prefer to go in April or in October, when the temperature is nicer, the crowds have thinned, and hotel rooms in the French Quarter are more plentiful and reasonably priced. New Orleans is an epicurean delight from the famous muffaletta sandwiches, to a bowl of red beans and rice, to shrimp Creole and jambalaya. Or treat your taste buds to a steaming bowl of gumbo. No trip to New Orleans is complete without visiting my favorite place in the French Market and that is the Café du Monde. 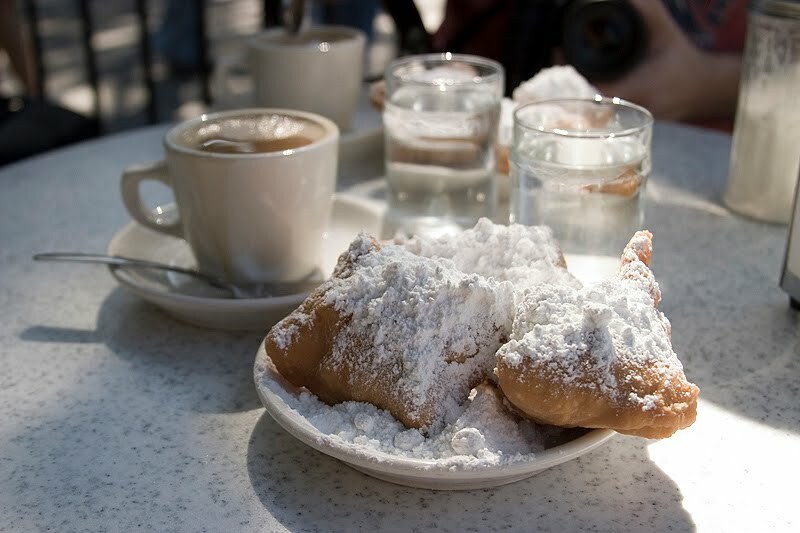 Grab a table on the patio, savor a cup of chicory coffee and indulge in warm beignets sprinkled with powdered sugar, while listening to the joyous sounds of a sidewalk jazz band. Delicious food, laid-back atmosphere, and music that stirs the soul. Little wonder that New Orleans is called The Big Easy. This entry was tagged beignets, Fat Tuesday, March Madness, New Orleans. Bookmark the permalink. We blame the heat and humidity, but it might be a cultural adaptation. Not sure, but it’s an idea worth pondering. As I read Debbie’s lovely account about New Orleans on Fat Tuesday, I am looking out my office window at snow piled every where. Might be a good time to visit that southern city.